If you ever wondered how is chocolate made or where does chocolate come from, then this page will help you discover the answers plus share a few chocolate facts and easy chocolate recipes. To learn how is chocolate made first, you'll never believe what the chocolate that we enjoy today looks like from the beginning. 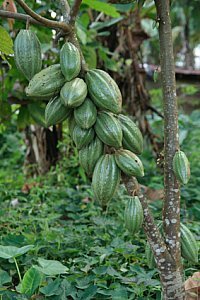 It all begins south of the equator in large pods that grow on the cacao tree. From the halls of Montezuma Ancient Mesoamerican civilizations used to give the cacao tree an important place in society. The Mayans and the Aztecs used to use cocoa beans as currency. Crushed cocoa beans were used to make a bitter liquid called xocoatl. Only royalty and the best military warriors could gain access to the drink. 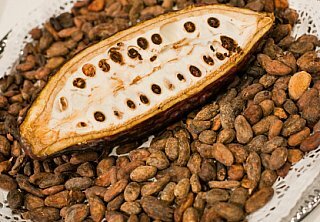 It wasnt until European settlers came to South America and Africa that the cocoa bean made its way to the modern world. 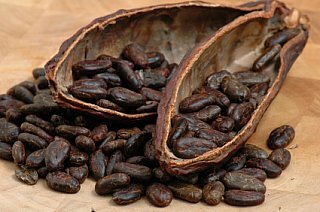 Even though that has a few hundred years ago, the process of prepping the cocoa bean for chocolate manufacturing remains pretty much the same. Cacao trees produce large fruit pods on the trunk of the tree. The pods are harvested with machetes. When you crack them open, youll find about fifty or more seeds within a sweet pulp. Young cocoa bean plant How is chocolate made starts with these cocoa beans inside a cocoa fruit. How is chocolate made from cocoa beans? The pulp and the cocoa beans are removed and placed in buckets for fermentation. Depending on the type of cacao tree and the manufacturer, the process can take a week or longer. Fermentation gives the beans some semblance of the chocolate taste we like. Once the fermentation process is complete, the cocoa beans are spread out so that they can dry naturally in the sun. It is the dried beans that are shipped to chocolate manufacturers all over the world. Once there, the beans are roasted, much like coffee beans. Roasting intensifies the final taste of the chocolate. When the beans are ready, the shells are then removed. What you are left with is the essence of the bean  cocoa butter and other chocolate solids. Now, how is chocolate made from this, read on. A machine grounds the shelled beans into a paste that is referred to as chocolate liquor even though it is not a liquid or contains alcohol. From here, it is a magical process, if you will, that varies from manufacturer to manufacturer. Even though some of the ingredients are trade secrets, the process is quite similar. The chocolate paste goes through a machine that removes the cocoa butter. This leaves you with a powdery cocoa. Substances like cocoa butter (re-added), sugar, milk, oil and the like are added to reconstitute the powder into chocolate. The last step in chocolate making is conching. The chocolate is mixed in a large machine until it is the consistency the manufacturer likes. After, the chocolate is poured into molds, allowed to cool, wrapped up and then packaged for shipment. 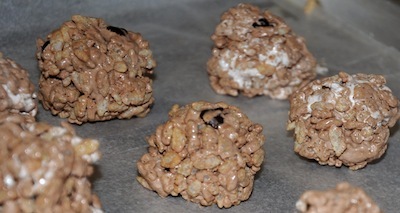 Semisweet morsels These are perfect for chocolate chip cookies or any type of add ins in baking. Semisweet chocolate bricks  This is baking chocolate. It can be cut up and melted for chocolate candy, chocolate cakes and icings. Unsweetened dark chocolate bars  Unsweetened chocolate is used for recipes that call for other sweet ingredients like sugar or honey to offset the bitter taste. Many unsweetened dark chocolate bars dont contain anything but cocoa solids so they are safe for those with food allergies. Dark chocolate or milk chocolate bars  With or without the nuts or fruit pieces, these are great for eating. Milk chocolate is creamy but the added milk also adds calories and fat. 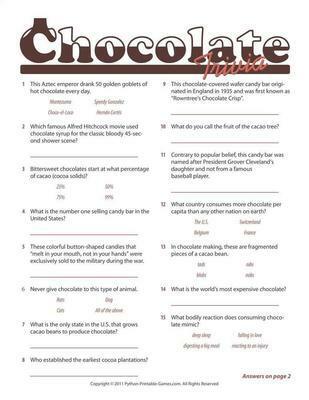 Depending on the chocolate manufacturer, you may get a different taste with each brand you try. Cocoa powder  This is where the chocolate begins as a presscake once the cocoa butter is removed. The presscake can then be packaged as cocoa powder for hot chocolate and also for baking. Unsweetened baking cocoa is best for recipes. Hot chocolate has other dried ingredients added like sugar and dehydrated marshmallows. It is just for drinking. 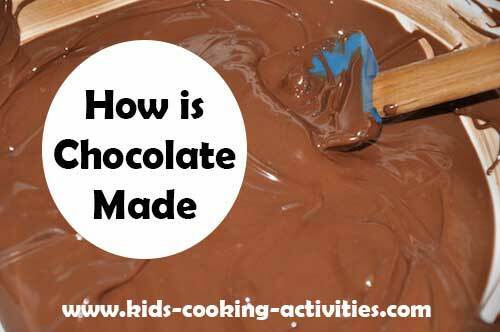 Now that we've answered the question, how is chocolate made, create some easy chocolate recipes. Learn how to make homemade chocolates. Create some homemade chocolate fudge. Preheat the oven to 375 degrees. Lightly spray a baking sheet and set aside. Add the flour into a mixing bowl. Add 4 T of sugar, the baking powder and the salt and whisk until blended well. Add butter pieces over the flour mixture and blend together until mixture is crumbly. Mix in the chocolate chips. Place the egg yolk into a small mixing bowl. Whisk in the half and half until well blended. Pour the egg mixture over the flour mixture and stir with a fork until a soft moist dough forms. Sprinkle a little flour over a flat surface such as a cutting board. Place the dough on the prepared surface and knead with your hands 6 times. Pat the dough out to form an even circle or press into a small cookie sheet. Cut the disk into 6 pieces with a sharp knife. Place the scones on the prepared baking sheet. Sprinkle the remaining 1 t of sugar evenly over all the scones. Bake 20 minutes or until golden brown on bottom and just starting to brown on top. Cool the scones on a wire rack. Makes about 6 scones, serve warm. Cover 2 baking sheets with wax paper, set aside. Place the butter into a large saucepan. Place the pan over medium high heat and allow the butter to begin to melt. Stir in the cocoa powder until blended in well. Add the marshmallows and stirring often, heat for 5 minutes or until the marshmallows has completely melted. Take off the heat and stir in the cereal until well coated. 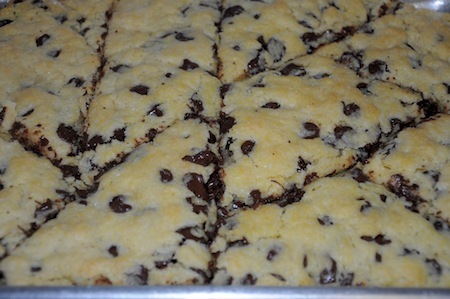 Stir in half of the chocolate chips. Lightly oil your hands with liquid oil. Form the mixture into balls about the size of golf balls. Place the balls on the prepared baking sheets. Let the balls stand at room temperature until cooled. 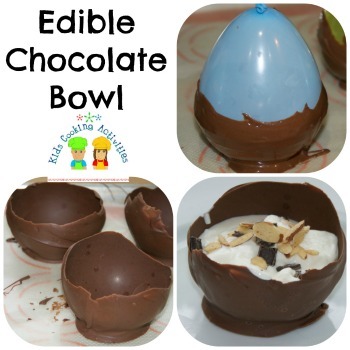 Make an edible chocolate bowl. On to more Activities from How is Chocolate Made?